Description Pulpit seat for three. It was used in the Catholic Church in Sitka in the 1920's. Rose colored with gold square pattern-wooden frame. 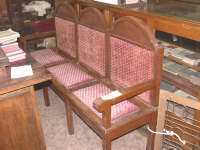 This seat was built in 1915, upholter made of cloth of red squares cream colored diamond design on back.